That's what I had too, but I thought it was because my client of WoW didn't have the fonts to display the Chinese characters correctly. I will look into it too. 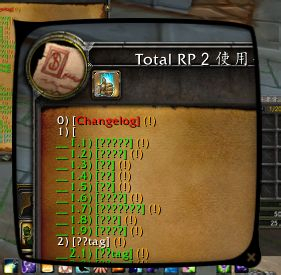 Do you have a version of yours, fully working, so I can see if I'm missing something you've changed to make Total RP 2 compatible with Chinese writing? 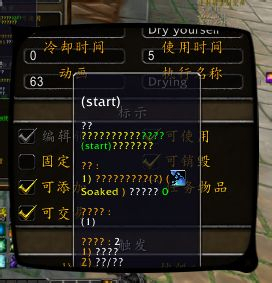 Ellypse wrote: That's what I had too, but I thought it was because my client of WoW didn't have the fonts to display the Chinese characters correctly. Maybe this is the reason why it's unprintable? I'm heading home now and I've looked at the deferences between your version and mine while in the train. It helped me a lot. You've changed the font used everywhere in Total RP to use one that I believe correspond to Chinese writing, ZYKai_T. 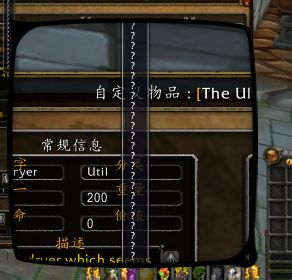 I will look into modifying Total RP to switch to that font when the language is set to Chinese. I've modified the addon so it uses the fonts you've been using in your version. Unfortunately it seems that I can't install the Chinese version for WoW as I have a european account (Chinese is not listed in the language choices). Can you tell me if this version is working and if I'm missing a spot where the font needs to be switched? Thank you I will change that tomorrow. Sorry for the delay, I got busier than I thought. As patch 5.4.8 seems to be for this week, I will have to ship version 1.026 along with it. It will include the Chinese translation in its current state (along with other quick bug fixes). So I don't know if it works correctly or not, but as it doesn't interfere with the other languages I don't need to remove it before release. Please, let me know if it's still not working when you have time. Version 1.027 will be the last one for Total RP 2 and it would be great if the Chinese translation worked before the long wait for Total RP 3. (eg. type nihao ^space with any type of hardware signal the result will be nnini'hni'hani'hao你好, which should be ni'hao and press space to make it change to 你好) . Copy&paste works fine but some time it shows CRLF in code when other players look at it. I don't know if you're familiar with IMEs and XML (which I'm not good at ). But it would be great to have your help. Since it's hard to explain the problem with plain text, and it's hard to host an image here. I might going to send you an e-mail about this or it's great that if you have any IM that supports images(msn or so). I'm currently working on it and if I can't touch you before this Sunday, I will update my progress here. I understand the issue. I admit I had no knowledge about how Chinese characters were entered in text field, but now I get it. We have the same issues with some latin characters (ñ is entered by typing ~n, ï with ¨i) and it always was an issue with Total RP 2. I will see what can be done, I will try to ask Telkostrasz what's his thoughts about this, maybe he knows the best way to fix this behavior. You can send me an email at ellypse.celwe@gmail.com. I do have a Skype account, but I'm never on it so email is the best way to get in touch with me. I spoke to Telkostrasz and I think I found the issue. It is the exact same one I have with my system. I have a Mac, and when I want to enter an accentuated letter like ë it actually put ¨ then e and then the system replace it with a ë. It's a similar behavior to you entering ni'hao and then your system replaces the word with the Chinese characters corresponding. (Telkostrasz explained to me that it is used to delete specific characters used for serializing in some fields, so the characters #~µ$@ should not be used in the background, the description and some creation fields). The issue here I think is that self:SetText(self:GetText()). It insert the current text in the text field... into the text field. I think it's messing with our systems trying to replace characters. It insert the text and then the system tries to do its thing. On my system it means for ¨e, ¨e is set for the text and then my system replace the last character with an ë. For your's, I think it looks for a correspondance in Chinese characters and returns the actual characters if it doesn't found any, so it searches for "n" "ni" "ni'h" and "ni'ha", and then "ni'hao" is identified so it replaces it for "你好". The result is all those characters concatenated. I will change that behavior when I get back home to day so the gsub is triggered only when the text field loses focus. Then I will release a beta 4 for version 1.026 and will hopefully release it in a few days. Ellypse wrote: I spoke to Telkostrasz and I think I found the issue. Nice thought on losing focus, never think of that. I'm trying to unify all text fields and delete those characters when saving. Wondering if it's going to work. Actually, triggering the gsub when loosing focus didn't work as it is saved before the focus is lost. I end up putting it when saving. Ellypse wrote: Actually, triggering the gsub when loosing focus didn't work as it is saved before the focus is lost. I end up putting it when saving. I was trying to do the same thing but those French function names really gave me a hard time lol. But I realized it's not "parfait". Does the languages feature works? It's comparing languages name using hard coded localization and the Chinese ones are not in the list yet. I will add them for the release of version 1.026.